There are many different kinds of turtles that people keep as pets. Some turtles are land dwellers, some are aquatic, and some spend time in both places. 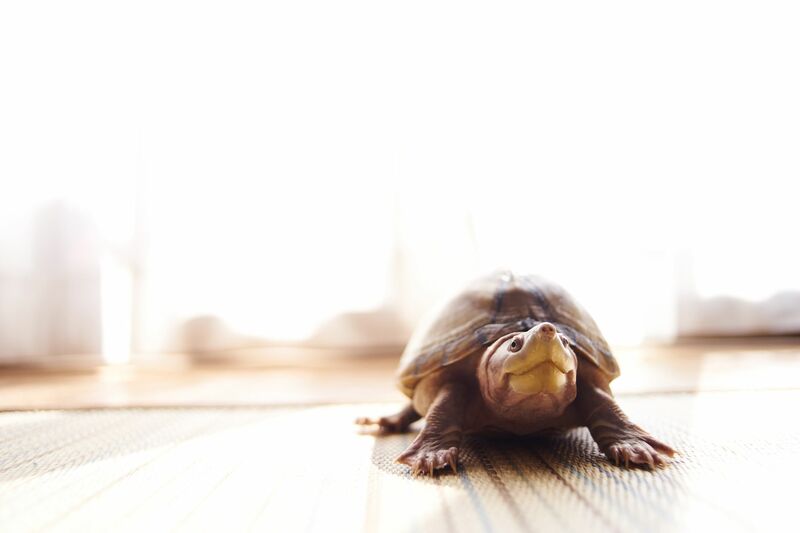 Whether you have or are considering getting a sulcatta tortoise, box turtle, painted turtle, red-eared slider, side-neck turtle, or another kind of turtle you need to make sure you can provide for all of their needs properly. All turtles require special lighting and heat, food, a place to hide, and an enclosure that keeps them safe. Turtles are reptiles just like lizards and snakes and all reptiles require supplemental heat to regulate their body temperature. They also need invisible UVB rays that the sun emits to help metabolize important things like calcium. Special heat lights, under-tank heaters, water heaters, ceramic heat emitters, and UVB emitting bulbs may be needed for your specific kind of turtle to help keep them healthy if they live in an indoor environment. Red-eared sliders, African side-neck turtles, yellow-bellied sliders, painted turtles, mud turtles, diamondback terrapins, softshell turtles, map turtles, Asian leaf turtles, and even Palawan forest turtles are all examples of aquatic turtles. Some people are able to house their aquatic turtles in a very natural setting like an outdoor pond. This is only possible in a warm climate or, in a colder climate, during the warm summer months. Care requirements are simplified in regards to heat and lighting in the warm and sunny months of the year for outdoor turtles. Many turtles that live on land are called box turtles because of their boxy shape. These turtles are all relatively small and have similar care requirements but are very different from that of an aquatic turtle. With proper care (which is not always easy to provide), box turtles can live up to 50 years. Eastern box turtles, Gulf coast box turtles, ornate box turtles, three-toed box turtles, and Asian box turtles are all examples of box turtles. Box turtles can be housed outside if you provide them with a safe and secure enclosure. Certain needs must be met though so that predators cannot get to them and they can get out of the sunlight if need be. Fencing that is sunk into the ground, a cover on the top of the enclosure, a watering hole and a place to hide must all be considered. Tortoises are known to live a long time compared to many of their shelled cousins. These long-lived pets require special care since many of them may outlive their owners. Dietary requirements, clean up of these large tortoises, and enclosures must all be considered before committing to getting a tortoise as a pet. Examples of tortoises sometimes kept as pets include leopard tortoises, Hermann's tortoises, Russian tortoises, red-footed tortoises, sulcata tortoises, Greek tortoises, hingeback tortoises, star tortoises, and radiated tortoises. If you can't house your tortoise outside (and outdoor housing can be complex and difficult to maintain) then you'll need an indoor enclosure. Large tortoises will most likely need a custom built enclosure or an entire room dedicated to them. Some tortoise owners even have both an indoor and an outdoor enclosure for different seasons of the year.